Barbara became interested in photography years ago when her father bought her a 35mm camera and encouraged her to take a photography course at Cuyahoga Community College in Cleveland, Ohio. The camera became her magical tool, capturing the essence of the world around her and allowing her an avenue of interpersonal expression. She discovered the images of Dorothea Lange and Walker Evans and knew this was the type of photography she would like to pursue in her own style. Barbara graduated from Ohio Institute of Photography in 1982 with a Bio Medical and Fine Arts Photography Degree. In addition, she studied with Howard Bond in his Zone System Workshop, with Bruce Barnbaum in his Photographic Arts Workshop with large format cameras, and with John Sexton and Morely Baer in an Ansel Adams workshop. Barbara has shown her photographic works nationally and internationally, including shows in Kansas, Maryland, Illinois, and India, including exhibitions at the Cleveland Art Museum, Cleveland Center for Contemporary Art, Cleveland Ohio, FAVA Gallery (Firelands Association Visual Arts) Oberlin, Ohio, Society for Contemporary Arts, Kansas City, Mo. Gallery Representation at Art -101 art gallery, Medina, Ohio. She has been recognized and praised for her work throughout Ohio. Barbara is well known for her ability to capture more than the visual flat surface or the mere appearance of sites and areas. She goes beyond to the depth of our own personal experience and emotion. Her urban portraits were published in the photography book, “Images Of The Heart: A Bicentennial Celebration Of Cleveland and Its People.” Her landscape images are featured in another book called “Cleveland: Continuing the Renaissance” as well as other publications for calendars and books. My passion for photography, natural landscapes, and constant learning motivates me to go to extraordinary places. My experiences on Ossabaw have reinforced my sense of dedication to use my art form of photography as an inspiration for others to work together to save nature’s places of spiritual sanctuary for future generations. 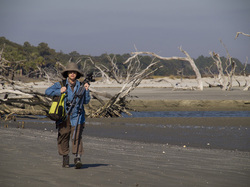 The landscape of Ossabaw Island, Georgia is a new body of work I am now photographing while discovering the intimate beauty of this remote island’s natural, unspoiled environment. With every trip to the island, I discover anew the serene beauty of the environment of Ossabaw Island with its beaches and dunes, moss-laced cypress trees that reflect off the black swamp waters, and tranquil wide marshes. This remote island is one of the most intriguing areas in Georgia. My work interprets and reflects my response to the landscape in exquisitely detailed pure black and white photographs, captured with my 4x5 view format camera. In printing the images, I utilize traditional silver gelatin, now an increasingly rare process since the rise of digital photography. I believe the true beauty of a photograph can only be captured, in it’s purest form, in a traditional darkroom. Handcrafting allows each creation to be its own unique piece of artwork.